EDINBURG — Before the start of the 2018 season, UTRGV senior Austin Siener had never played first base. As a freshman at Illinois Central College, he played third. 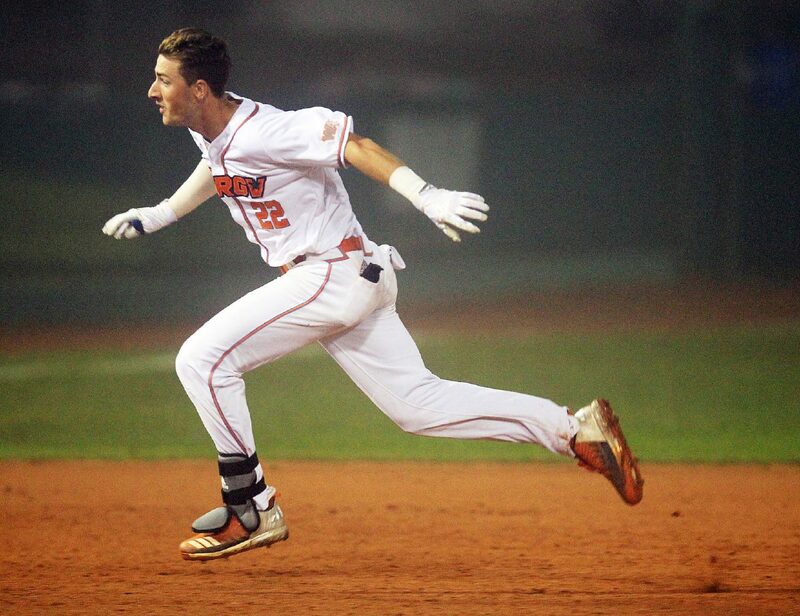 He moved to shortstop as a sophomore, then shifted to second base when he came to UTRGV for his junior year in 2017. Looking at UTRGV’s personnel during the fall, first-year coach Derek Matlock figured sliding the 6-foot-3 Siener to first was the easiest way to fit his best bats into the lineup. So Siener this year completed his unorthodox four-year trip around the diamond, playing 31 games at first base. The change has paid dividends for UTRGV, as Siener holds a .989 fielding percentage and has regularly combined with second baseman Anthony Gomez, shortstop Ivan Estrella and third baseman Tyler Torres to help UTRGV rank second in the NCAA with 40 double plays this season. Siener has also been steady at the plate for UTRGV, posting a .282 batting average and leading the team in RBIs (20), steals (six) and home runs (three). UTRGV (17-16, 3-3 WAC) returns from an eight-game road trip with a series against Grand Canyon (17-15, 8-1 WAC) beginning at 7 p.m. Friday at UTRGV Baseball Stadium. Matlock said Siener’s transition to first took “a little bit of work early,” but the adjustment was fairly quick because of Siener’s athleticism and willingness to accept coaching. Offensively, Siener’s batting average is 32 points better than the .250 he posted last season. He hit .333 prior to UTRGV’s conference opener on March 23 but is batting just .200 in 11 games since. He said the key to returning to his early season form is staying focused and mentally strong. “Storms are going to come and go, so I’m just going to keep on fighting through, keep on pushing, and hopefully get back to it this weekend,” Siener said. Siener’s struggles have mirrored UTRGV’s, as the team’s win against Texas State on Tuesday snapped a six-game losing streak. The Vaqueros averaged 5.4 runs per game before the start of conference play but are scoring just 3.3 runs per game since. On the mound, UTRGV will be looking for a return to form for starter Carter Johnson, who was given last week off after allowing four runs on five hits and two walks in just three innings against Utah Valley on March 30. Matlock said Johnson’s fastball velocity dipped from the low 90s to the high 80s, and many of his pitches were running to his arm side. In years past, Johnson told Matlock, the week of rest has led to stronger performances down the stretch. Jorge Flores (3.77 ERA) and Chase Adams (4.20 ERA) round out UTRGV’s weekend rotation, with seven-game starter Trevelle Hill (5.31 ERA) potentially available out of the bullpen as he battles a knee injury.